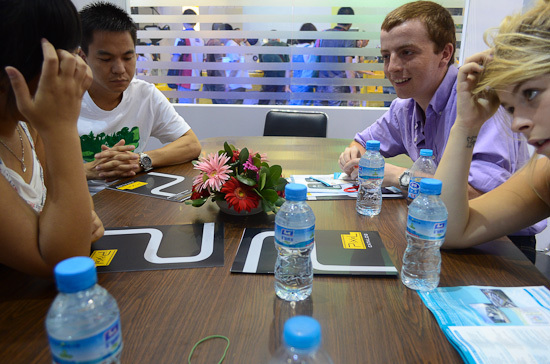 At the Interphoto trade show in Shanghai, new products and developments are presented and discussed by Aputure, CononMark, Jinbei, MeiKe, Phottix, Pixel, Yongnuo and other manufacturers. The Lighting Rumours team are in Shanghai, and have visited the Photo & Imaging (also known as “Interphoto”) July trade show at Everbright Convention Centre. Here’s what we found out. The Aputure Gigtube Wireless live view remote is to be succeeded with a new model offering more features. The upcoming Gigtube Wireless II will add a “CCTV mode” whereby a miniature camera built in to the device will film through your viewfinder, in case your DSLR does not have a live view feed of its own. For cinematographers, the updated Gigtube Wireless II will be able to control start and stop of video recording by means of “infrared technology”. Up to four cameras may be controlled with the latest remote, with the ability to switch quickly between the different video feeds at the press of a button. The transmitter will add a memory card slot, allowing stills to be captured from the live view feed (but not video). This isn’t the same thing as, say, an Eye-Fi card, as the camera’s own files are not transferred. As before, both transmitter and receiver use proprietary rechargeable lithium batteries. We were also shown Aputure’s latest “Amaran” LED video light. The unit may be dimmed and has the ability to add diffuser panels and colour filters. 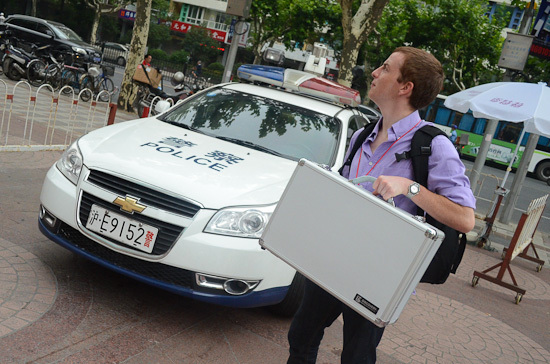 The LEDs offer a wide area of illumination and can be powered by lithium video camera batteries or AAs. An indicator light on the back shows how much charge remains. Reviews will come in the near future. Shenzhen Gaoneng Photographic Equipment Company, aka CononMk, showed off the replacement to the DD400S 12V monolight (originally reviewed here). 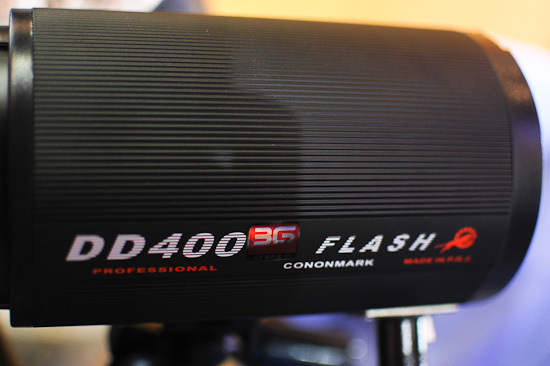 The new light, the “DD400 3G”, features a superior mounting bracket and a 3GHz remote allowing wireless control of all the flash settings (the receiver is built-in). The remote mounts on your camera hotshoe, also acting as a flash trigger, and can work from up to 100 metres away. As before, the DD400 may be powered by 12V battery, car cigarette lighter or AC adapter, and uses a Comet-type accessory bayonet. Power reduces to a minimum of 1/64. There is an integrated coldshoe on the back of the monolight for holding third party radio receivers. Other specifications are generally the same as the original. 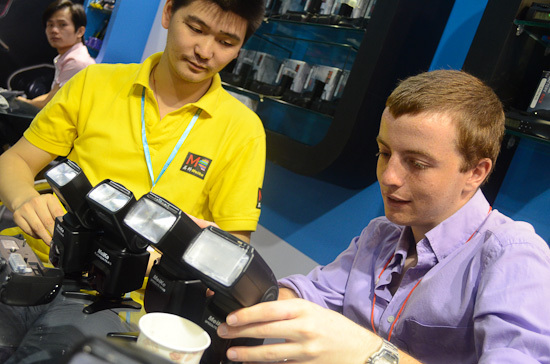 Shanghai-based Jinbei had a vast display showing off their whole range of lights and accessories. 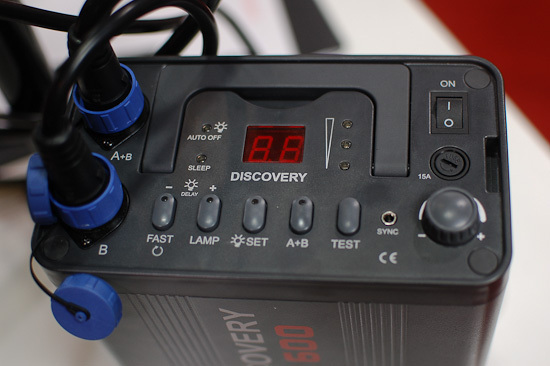 The new Discovery DC-600 and DC-1200 battery pack-and-head systems were present, and we acquired a two head 600J kit to review. In related news, British distributor Lencarta have decided to brand their version of the DC-600 the “Safari Li-ion”. The older Safari, based on the Jinbei Recharge Digital RD-600, will be renamed the “Safari Classic”. 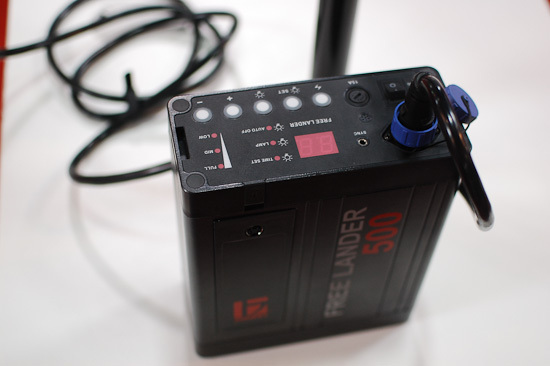 The older Freelander 500, a battery pack with just one output socket, seems to have been remodelled in similar style, and was demonstrated working with Discovery-type flash heads. 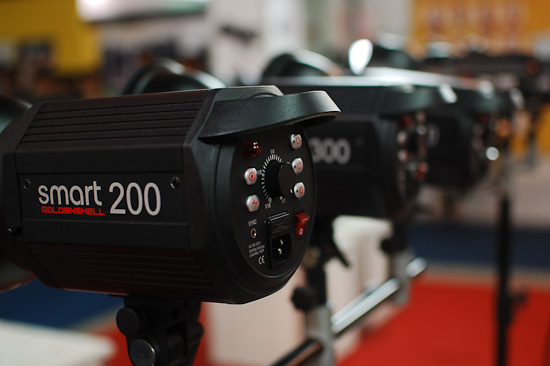 Entry-level Spark series monolights, coming in 200J, 300J and 400J models, have had a minor facelift and the range has been renamed “Smart”. 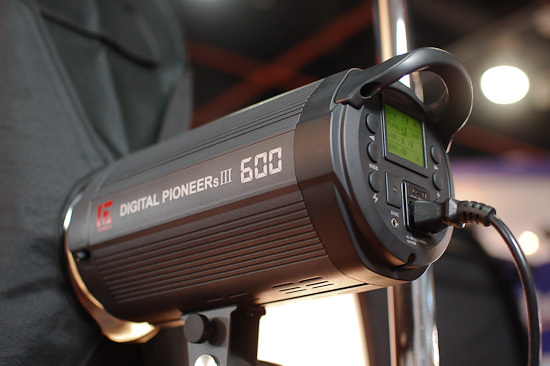 Jinbei has updated their popular prosumer monolight, the Digital Pioneer series. The Digital Pioneer III has all digital push-button controls and improved circuitry over the last model. A separate range, the Digital Pioneer IIIs, add in a more detailed LCD screen and a wireless remote controller. Taiwanese MeiKe, best known for their battery grips, have released three flashes alongside their current MK930 manual speedlight. MeiKe representative Macro guided us through their features. The MK950 is based on the same SB-900-style body of the MK930 and carries all of its manual features. That is, power down to 1/128, two slave modes, zoom to 105mm, a PC sync port and an external battery input. 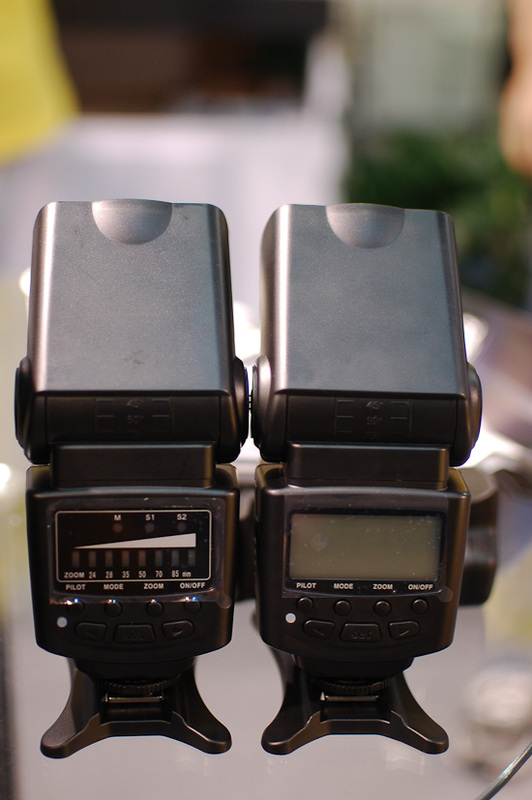 The MK950 adds a large LCD screen, TTL mode (with +/-3EV exposure compensation) and a metal hotshoe foot. 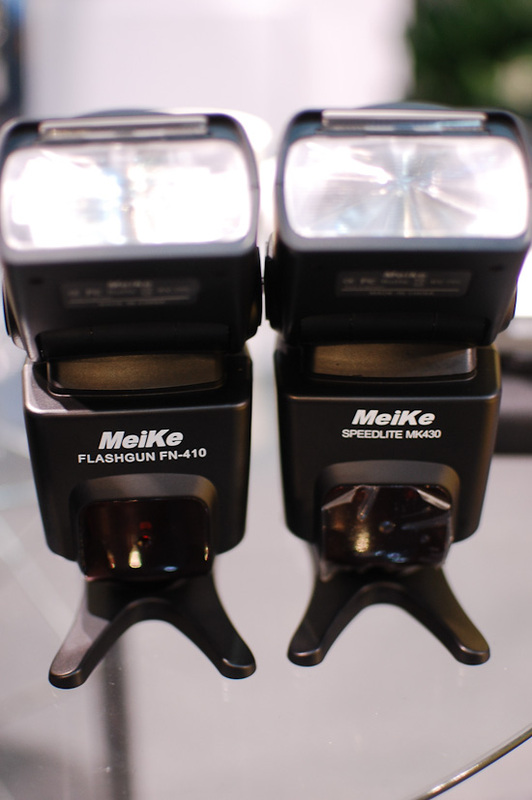 The MeiKe FN410 is almost identical to the TTL MK950, but in a pint-sized, 430EX-style body. The controls are the same, but the zoom only goes out to 85mm and the flash may be less powerful (though this was not confirmed). There is no external battery input and (probably) no sync port. 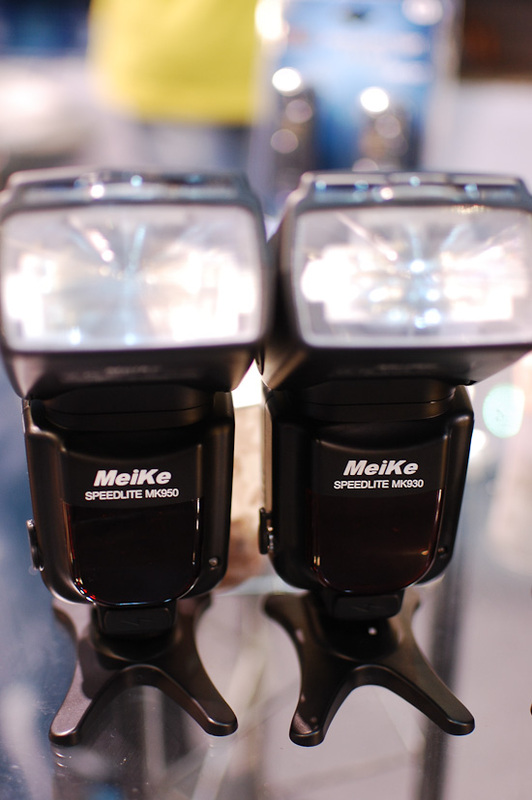 The MeiKe MK430, similarly, is a manual-only MK930’s features squeezed into a smaller flash. 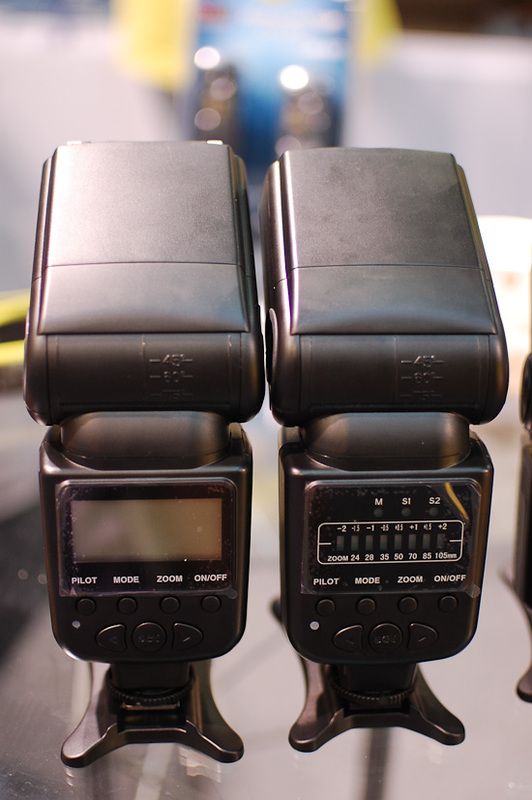 All three new flashes have metal hotshoe feet, but the MK930 continues to be sold with a plastic one. Steven Peer sat with us to discuss the latest developments in the world of Phottix photo accessories. 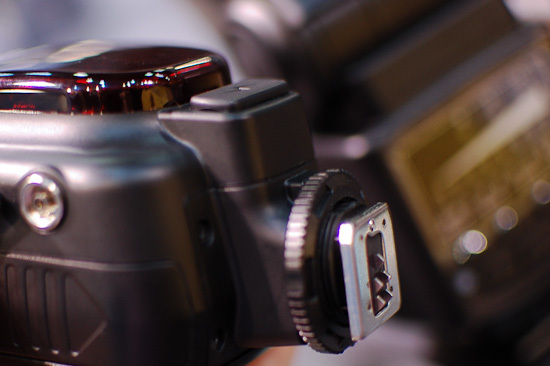 The Phottix “Odin” Wireless TTL Trigger was demonstrated on a Canon DSLR. 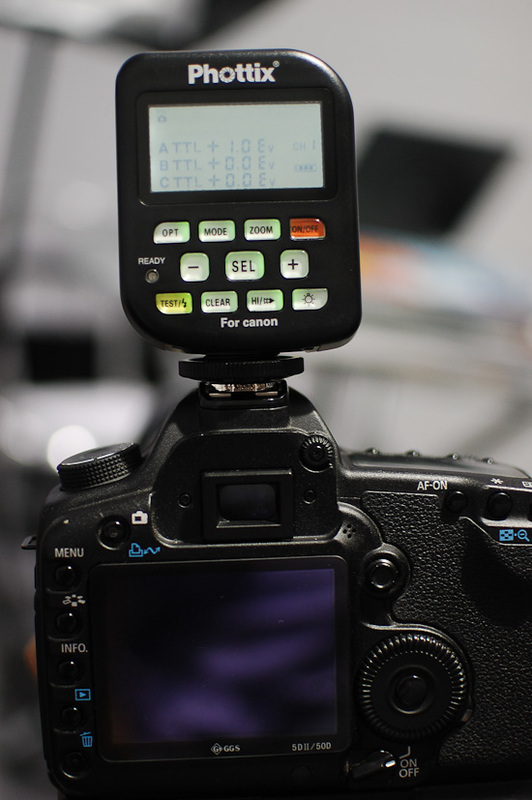 The settings on the back of the Odin allow you to control your flashes in similar types of ratios to those offered by a Canon ST-E2, or using Phottix’s own menu. The latter consists of three independent groups to which you can assign flashes. 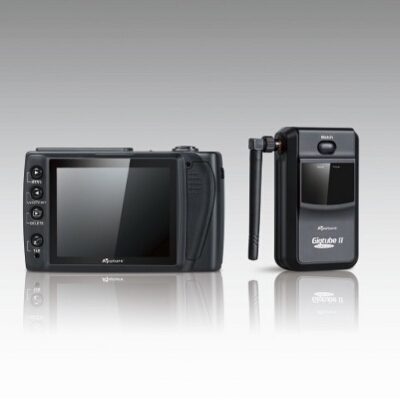 Each group can be set to a manual power level or TTL with +/-3EV exposure compensation. Additionally, the zoom setting on each flash can be selected, with the default being “Auto” for tracking your camera’s lens focal length. There are four radio channels. The Odin receivers have a 3.5mm sync port for triggering manual flashes and studio lights. A basic triggering function is supported, but there is no “hyper sync” feature. 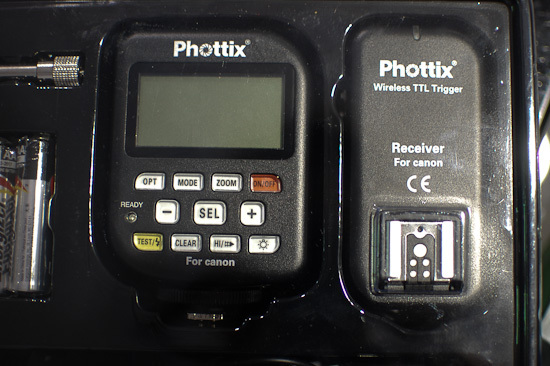 In addition to the Phottix Wireless TTL Trigger for Canon, which is close to release, there will also be a Nikon version. Projections for the i-TTL Trigger optimistically suggest “by the end of the year” but this is to be taken with a pinch of salt. While the Odin is only designed for use with Canon or Nikon’s own flashes, third party speedlights from Nissin and Metz have been tested successfully. 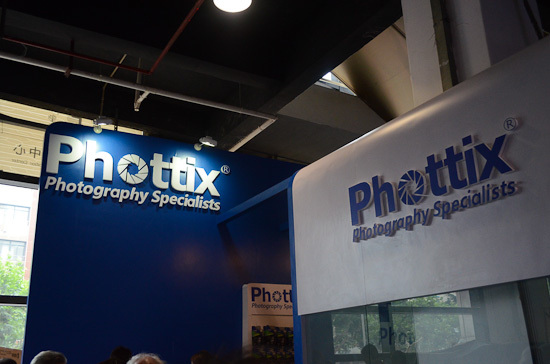 Now, whatever happened to the Phottix Foton series of speedlights? Unfortunately, the manual Foton has effectively been shelved and will not be released. 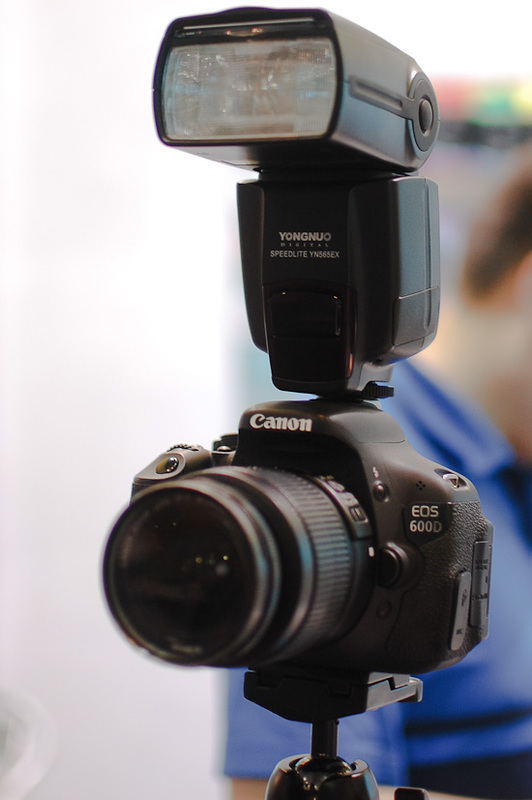 However, a TTL speedlight is in the works, with the Canon version slated to come out this October. In the meantime we received a sample of the latest model, the Strato II Multi, which we will be reviewing. 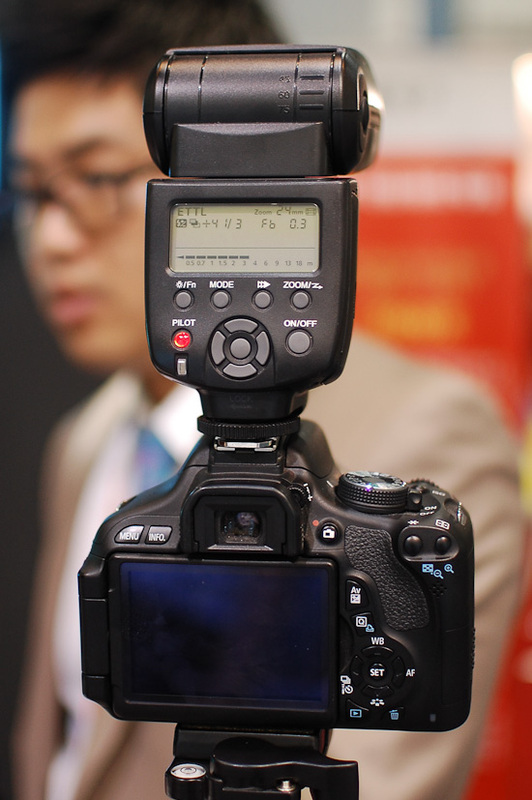 We spoke with Pixel Enterprise about their latest flash triggers. The Pixel Rook will not be backwards-compatible with the Soldier, nor cross-compatible with the Bishop. However, different models of the Rook itself, e.g. for Canon and for Nikon, will be able to trigger each other. A set of Rooks (one transmitter and one receiver) will set you back around US$160, and extra receivers will be available separately. The features of the Rook and the Bishop are the same, but the Rook is cheaper, more compact, takes AAAs instead of AAs, and has slightly different aesthetics. So why buy the bulkier, more expensive Bishops? According to the manufacturer, they offer “more stable” operation and have double the range of the Rooks (at 400 metres, vs. 200m). A Nikon version of the Pixel King is slated for release in “the middle of September”. Aesthetically, it will be almost identical to the Canon version. A Canon version of the Yongnuo YN-565EX speedlight was on display. It will cost US$180 and be released this August. The Nikon version will follow 2-3 months later. Each model will feature both a Nikon and Canon advanced wireless slave modes.